Photos provided by Barb Heiss, Kevin Slick, Jim & Marian Clatterbaugh, Pat Gonzalaz, Robert Taylor, Larry Ruggiero and Susan Gordon. 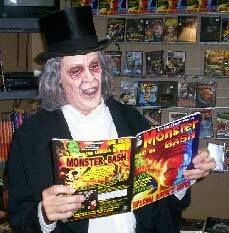 Composer, teacher Kevin Slick as the vampire from LONDON AFTER MIDNIGHT. 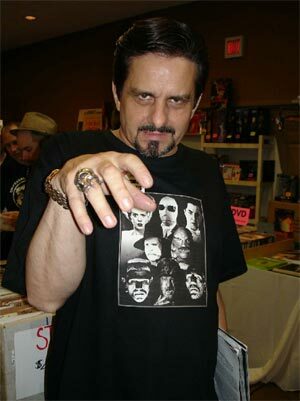 To our knowledge the second person ever to wear that hat in the make-up (after Lon Chaney). 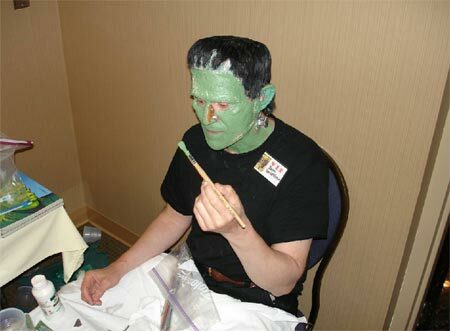 Make-up by Ron Chamberlain. 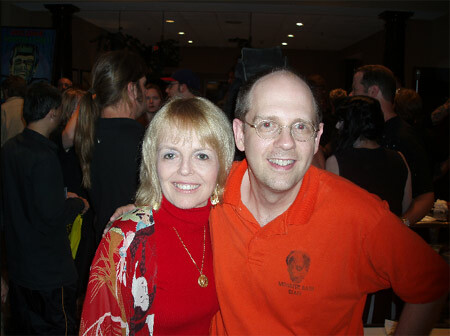 Actress Susan Gordon (TORMENTED, BOY & THE PIRATES, The Twilght Zone) with Ron Adams at Monster Bash 2006. Silent film score compser Kevin Slick, Ron Adams and Bela Lugosi's face...old friends. 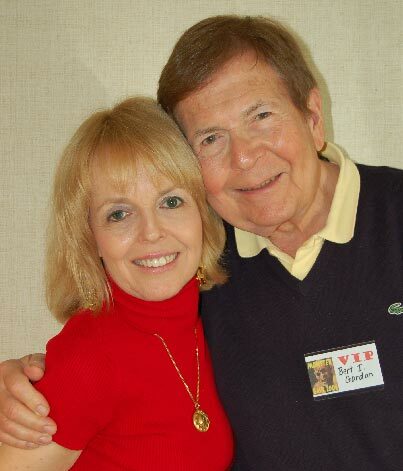 Father and daughter - Bert Gordon with Susan Gordon at Monster Bash 2006! 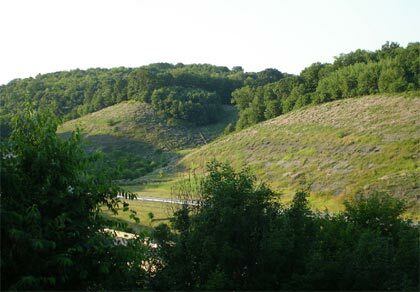 A view from Monster Bash hill, just outside the front entrance to Monster Bash 2006's hotel. 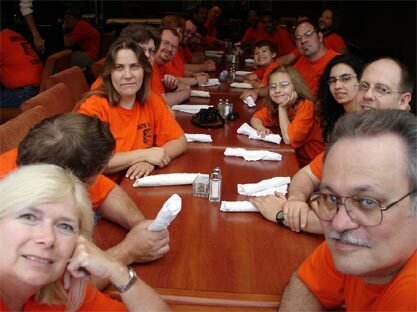 Not looking too-worse-for-the-wear, it's the Bash staff on Sunday evening...after Bash '06! A sea of orange. 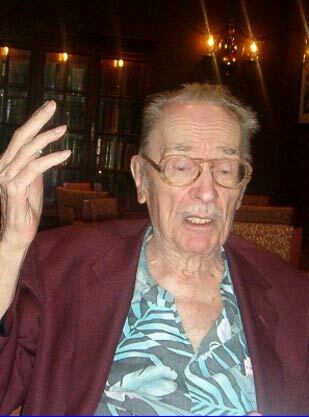 Timothy Herron making himself up as the Karloff monster at Bash 2006. Attendee John Santiago and Ron's head in the lobby. 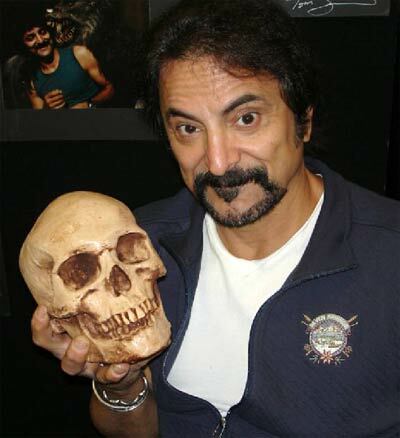 Tom Savini, movie wizard at home...at Monster Bash! Now THAT is scary. 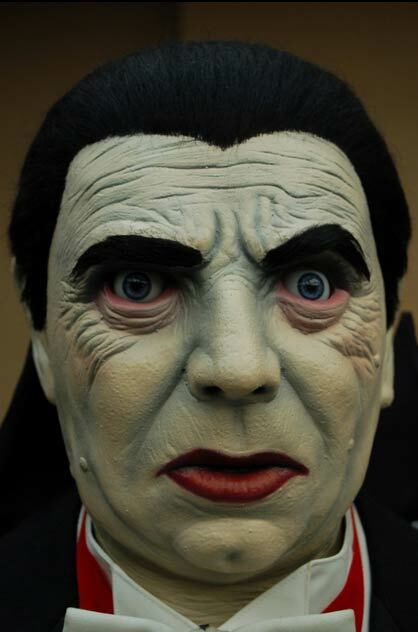 Bill "Drac" Edwards out of make-up. 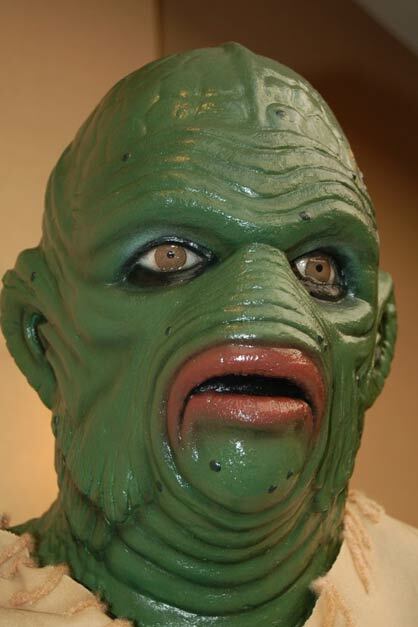 He delighted kids as the gill-man on Saturday morning and as the Teenage Frankenstein on Saturday afternoon! 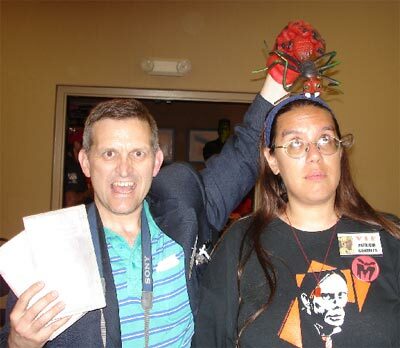 Attendee John Santeago had trouble with our props...this one bit him! 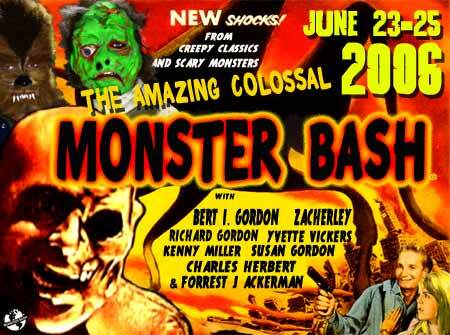 A teenager crashes the Bash....a Teenage Frankenstein , that is! 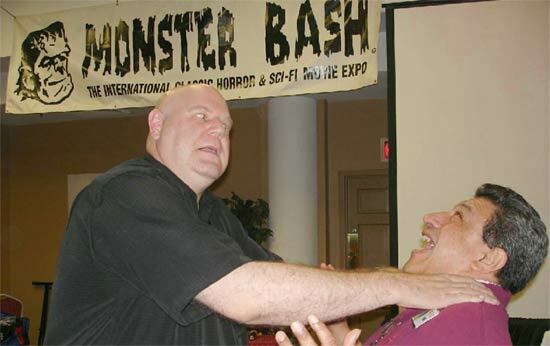 Tor Johnson loose at Monster Bash! 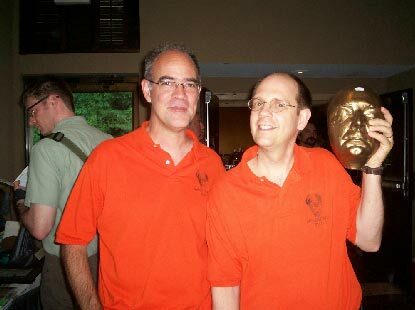 (Don Reese and John Santeago). Monster Bash orange-shirted staff members Tom Adams and his grandson Travis O'Conner. 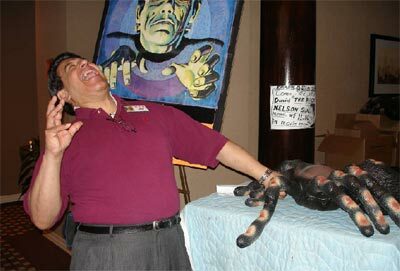 A Forry Story in the restaurant at Monster Bash! 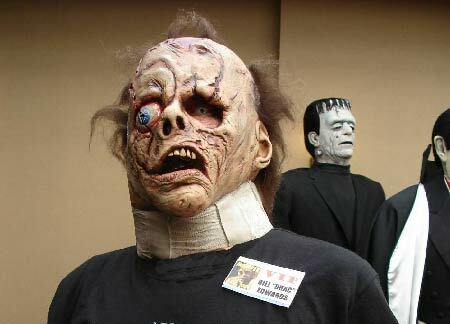 A nice detail photo from Jim Clatterbaugh of the CREATURE WALKS AMONG US from the lobby at Monster Bash. 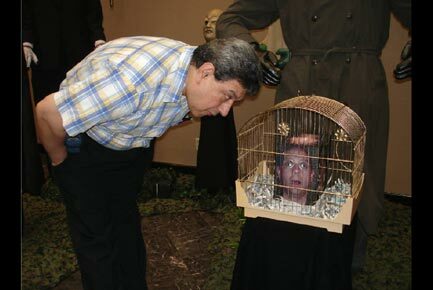 One of the seven-foot display figures from Susan and Jerry. Another of the figures in the lobby...bidding you "vvvelcome."